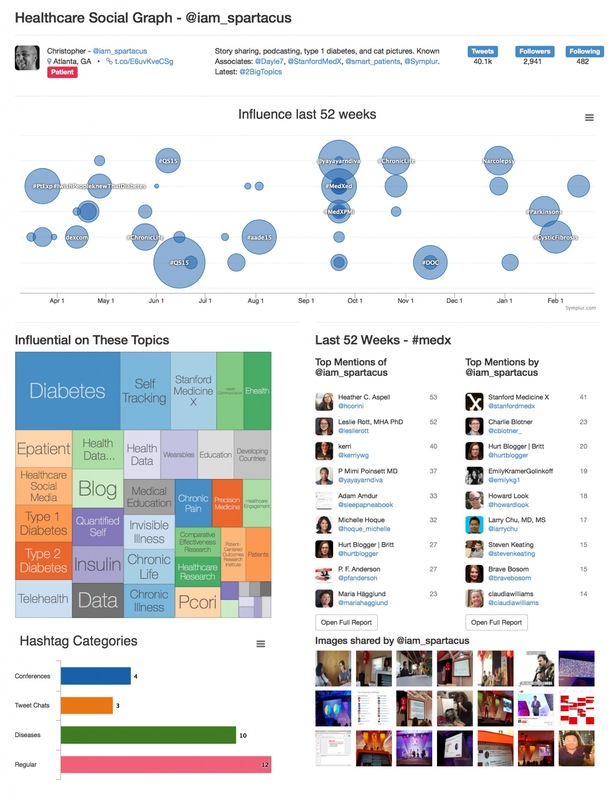 Healthcare Social Graph is available only to Enterprise customers. You may also look for information about the Healthcare Social Graph Score algorithm. The Healthcare Social Graph® is the vast neural network of healthcare conversations, content and people that gives life to Symplur Signals. As a Symplur Signals Enterprise customer you have access to three different perspectives into this graph. Investigate all conversations and people related to a specific healthcare topic. The platform is aware of all databases that should be analyzed for any given topic you as a user select, and you may go deeper by analyzing a single database like a hashtag. The individual perspective of the Healthcare Social Graph give users a quick snap shot of what healthcare topics, conferences, tweet chats and disease communities a Twitter user has been influential in during the last 5 years and with whom the user has engaged with. The following is an example page of the individual perspective.